Could a test using only a pen and paper be enough to diagnose Alzheimer’s disease? Researchers at The Ohio State University Wexner Medical Center believe that their Self-Administered Gerocognitive Examination (SAGE) test can help medical professionals find out a person’s cognitive ability early so they can have a chance to intervene before they develop the degenerative brain disease. "What we found was that this SAGE self-administered test correlated very well with detailed cognitive testing," Dr. Douglas Scharre, director of the Division of Cognitive Neurology and head of the Memory Disorders Research Center at Ohio State's Wexner Medical Center, said in a press release. "If we catch this cognitive change really early, then we can start potential treatments much earlier than without having this test." 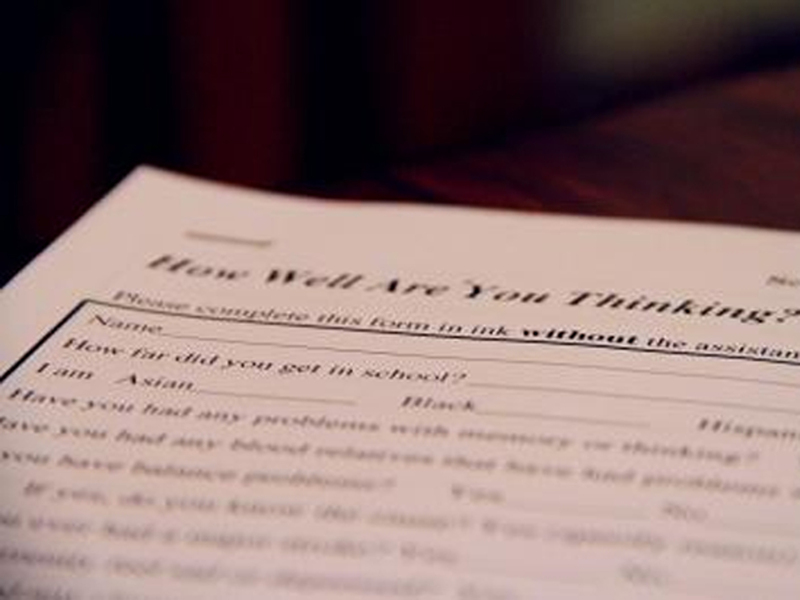 The 15-minute, 22-question test can be taken at home by patients, who then bring the paper to get examined by a medical professional. The researchers believe that it can spot the beginning signs of trouble for dementia and Alzheimer’s disease. The tests go through a variety of questions looking at different mental skills including orientation, through questions about the current date; language, through verbal fluency and picture naming tasks; reasoning/computation, by abstraction and calculation problems; visuospatial, from 3D construction and clock drawing; and executive (problem solving) and memory tests. - How are a corkscrew and a hammer similar? Write down how they are alike. They both are... what? - You are buying $1.95 of groceries. How much change would you receive back from a $5 bill? - Draw a large face of a clock and place in the numbers. Position the hands for 10 minutes after 11 o’clock. On your clock, label “L” for the long hand and “S” for the short hand. While the test cannot diagnose Alzheimer’s definitively, it is a good indicator of a patient’s cognitive abilities, according to the researchers. It may catch lapses in thinking abilities that might not come out in routine questioning or that patients may not notice themselves right away. "Patients just come in too late to be identified. They come into their doctors office perhaps three or four years after people have noticed specific cognitive issues," he said. Previous studies showed that 80 percent of people with mild thinking and memory problems would be identified by the SAGE test, while 95 percent of people without cognitive issues would not receive a worrisome score. Researchers in the new study tested 1,047 people aged 50 and older who attended community events, such as educational talks and events at senior centers, and found that 28 percent of them had cognitive impairment according to the test. SAGE test makers recommend seeing a physician for follow-up if a person misses six or more questions on the 22-item test. After the experiments, the participants were given their scores and information about the test. They were told to show their results to a physician and to tell them their initial score in order to use it as a baseline measure to compare future test results. "Hopefully, this test will help change those situations," Scharre said in a press release. "We are finding better treatments, and we know that patients do much better if they start the treatments sooner than later." The SAGE test was examined in the January issue of The Journal of Neuropsychiatry and Clinical Neurosciences. Dementia is a group of diseases that involve declining memory and thinking abilities. One in three seniors die due to a dementia-type disease, according to the Alzheimer's Association. Alzheimer’s is the most common form of dementia, and currently more than 5 million Americans are living with the disease, the Alzheimer’s Association added. It is the sixth leading cause of death in the United States. There is no cure for the disease nor do medical professionals know what causes it, though risk factors including diabetes, age, family history and genetic mutations. Concussions and cholesterol plaques recently have been associated with a greater chance of having the tell-tale protein plaque buildup in the brain that's found in high levels in patients with the disease. Dr. Simon Ridley, head of research at non-profit Alzheimer’s Research U.K., told the Telegraph that much more research is needed to see if the SAGE test is a valid testing alternative. “One drawback of this study is that the test was not compared with other existing cognitive tests. It’s important to note that the test is not designed to diagnose dementia, and people who are worried about their memory should seek advice from a doctor rather than attempting self-diagnosis with a test at home,” he pointed out.